Do you take the red pill, the blue pill, or the green pill? When I heard this comic was coming out, I was excited. I played the heck out of the Injustice video game but didn’t really read any of the prequel comic. 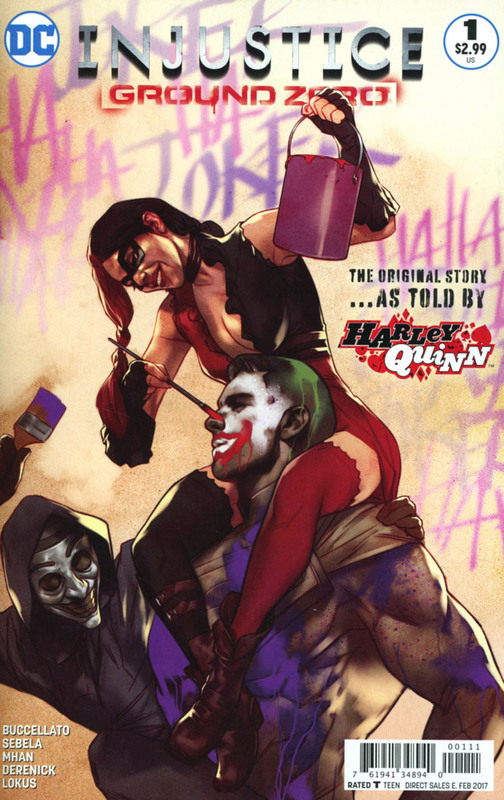 Knowing this is supposed to be the Injustice game story through Harley Quinn’s eyes, and supposed to lead up into the Injustice 2 comic, I jumped right into this one. Let's take a look at "All Bad Things Must End"
We start the issue with Harley narrating and recapping the beginning of the Injustice game story. It looks as if this is in the future, possibly passed the overall Injustice story. Things seem peaceful now as she's talking through the park, whistling to herself. The bright colorful art by Pop Mahn here is great and shows that things look fine. The recap is great for anyone who didn't play the game or read any of the prequel comic. Joker, his fear toxin, Lois dying at the hands of Superman under the toxin and finally killing the Joker. It all kicked off from there. We see that Harley is a hero now after losing Joker and teams up with Green Arrow and Black Canary and I love that they were once a team. It's too bad we didn't get more of their adventures here. Again, I love Mahns art here. It's cartoony but it's necessary as it shows we are in Harley's head right now. She was plucking sunflower pedals earlier and we can see she sees faces on them. It's hilarious. Lots more recap and then we see now that she is apart of the Insurgency, on Batman's side. She took Joker's goons and made them her own. Next, we see Harley still telling her story to an unknown person, or possibly to herself. Her story revolves around her infiltrating a former Regime green pill factory, the pills that make normal people super. She was chosen by Batman because of how dangerous she could be and time’s running out because the Insurgency is running low on supplies. So, Harley takes her and her newly formed Joker Clan goons to break into the Regime compound and take out all of the guards. That’s when Man-Bat comes in to try and stop her. Harley joke’s how he should be on the side of Batman because of the bat motif and all, which I found it to be a hilarious exchange between them. I gotta say, I love the art in this chapter. Even in day and night, Tom Derenick’s art is very colorful here yet captures the dark Injustice world. There was a small running joke in here that she doesn’t know her goons’ names, and that they should really get drinks to get to know each other. Again, hilarious. 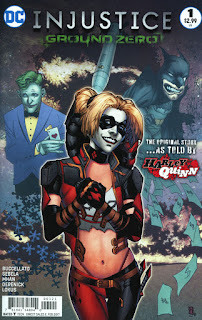 So Harley and Man-Bat fight, Harley takes half a green pill and kicks the crap out of Man-Bat. The goons gas the rest of the guards there but left the head of security to interrogate. He says the factory hasn’t been operational in sometime. Harley uses Lex Corps’ big red button device to open a vault that’s supposed to have more green pills. The vault is totally empty but it’s clear that Harley wasn’t there for any pills. After, telling us how great it feels to be out of The Joker’s shadow and into her own sunlight, she throws some dynamite and cheeses it with the goons. It’s revealed that Batman knew there wasn’t any pills there anymore. It was just a distraction for Superman as he’s trying to find out where he’s getting them from. Of course, Batman’s getting them from Lex. The issue ends with her and her Joker goons going to a bar called “Dead Shots! !” (I love it) and we’re left with an “End.” I love the art in this issue, from both Mahn and Derenick. The dialog Harley gives is hilarious and true to character. The relationship with her and her goons feels so genuine; they have a mutual liking to working with each other. The fight with Man-Bat was pretty awesome; nice little cameo. I love that they’re starting to delve into Harley’s psyche as she continues her life post-Joker in this Injustice world. “All Bad Things Must End” is a great beginning story to Injustice: Ground Zero. Christopher Sebela really knows how to write Harley so well and shows he really knows the world he’s working with. The art from Pop Mahn and Tom Derenick was awesome and very colorful. With this series, there doesn’t seem to be any required reading or playing to just jump into this comic, which you so definitely should.